The spread of methicillin-resistant Staphylococcus aureus (MRSA) has increased the use of scrubs but can give wearers a false sense of security that they are 'clean' when in fact are as easily contaminated as any other clothing. 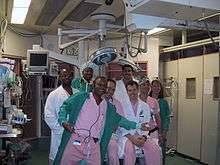 Scrubs worn in surgery are almost always colored solid light green, light blue or a light green-blue shade. Laundry service in a medical facility in Sierra Leone. The scrubs are cleaned in-house to prevent the spread of disease. 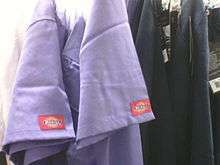 Surgical scrubs are not generally owned by the wearer. Due to concerns about home laundering and sterility issues, these scrubs are usually hospital-owned or hospital-leased through a commercial linen service.